Stacey seems like a normal girl, except for one secret that makes her different. She thinks she can trust the people she knows with it, but can she? 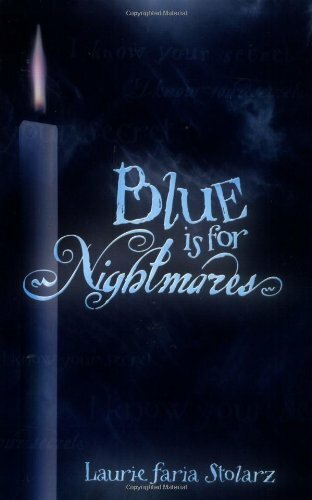 Blue is for Nightmares is the first book out of four by Laurie Faria Stolarz. It’s an eerie book about a girl named Stacey. Stacey’s junior year at boarding school is not easy. She isn’t the most popular, smartest, or prettiest girl at school. Stacey has a crush on her best friend’s boyfriend. And now, she’s having nightmares again, just like before. Three years ago, Stacey began to have nightmares about the girl she babysat, Maura. In her dreams Maura would be trapped in a shed and eventually be killed. Thinking that they were just nightmares, she ignored them. Later on, Maura was found dead in the same shed that Stacey dreamed of. So when she starts having dreams about her best friend, she tries to prevent her death. Stacey uses her grandmother’s old book of spells to find the right conduction using candles, cards, and herbs to help her cope with her nightmares. Having these nightmares about her best friend was hard enough, but when another girl gets caught up in it and will not accept Stacey’s help, it becomes even harder. Blue is for Nightmares is a book for people who enjoy suspense, murder mystery, and thrill. It kept me intrigued, and it was a pageturner. It was not a challenging read for me but if the reader has trouble with heavy books that involve gory death and kidnapping, then I do not recommend this book to them. The story is narrated by Stacey, who is a witch, which makes this book unique. I would suggest this book to girls because they might be able to relate to Stacey. This is a book for 6th grade and up, and maybe boys. After I finished the book, I was so intrigued that I couldn’t wait to read the next three. Each book has its own murder mystery story that involves Stacey and her nightmares. If you like a thriller, then this is a book for you.